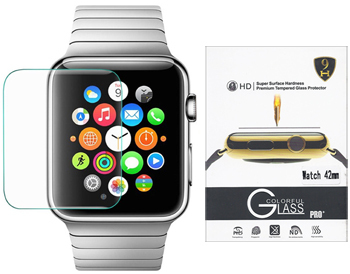 Tempered Glass Screen Protector for Apple Watch is a durable screen protector, designed for maximum protection of you and your device. With an industry-leading glass strength of 9H hardness, it protects your smartwatch from high impact drops, scratches, bangs and scrapes. It has an oleophobic screen coating that makes it oil-resistant and anti-fingerprint, as well as easy to clean. The screen protector's bubble-free adhesive is designed to adhere to your smartwatch without air pockets, maintaining your phone's touch sensitivity and touch-screen accuracy. And any bubbles that do occur should disappear within 1-2 days. It also has an anti-shatter film on the screen that, if the glass does break, keeps you and your phone safe by breaking into small pieces that stick together.